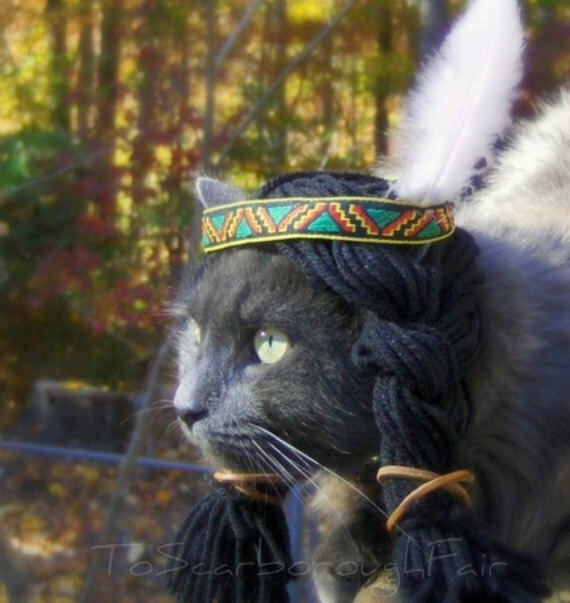 This Native American inspired costume features a wig made of yarn, traditional headband and a real feather. Attached with a “comfortable elastic cord”, this costume is sure to impress even the coolest cats in the neighbourhood. And perhaps it will encourage a dialogue on the history of the Native American people (and cats) and promote a deeper understanding of their culture. Or perhaps it will just look totally awesome, and that will be enough. 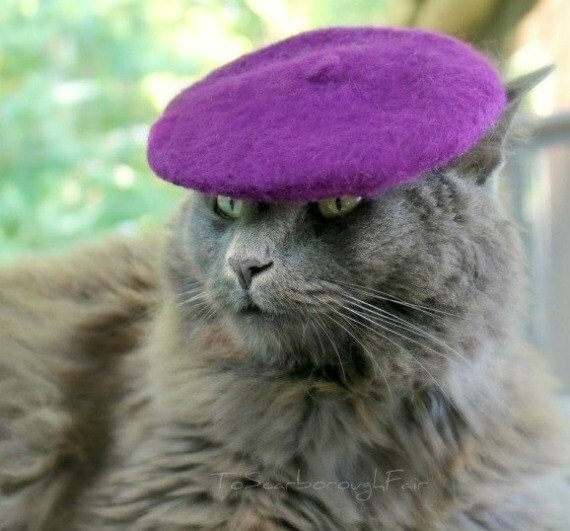 Or you might like this artistic and slightly mysterious looking cat beret. For the sophisti-cat who enjoys a cafe au lait and croissant every now and again, whilst reading sad poetry and staring longingly into the distance. Ooh la la. 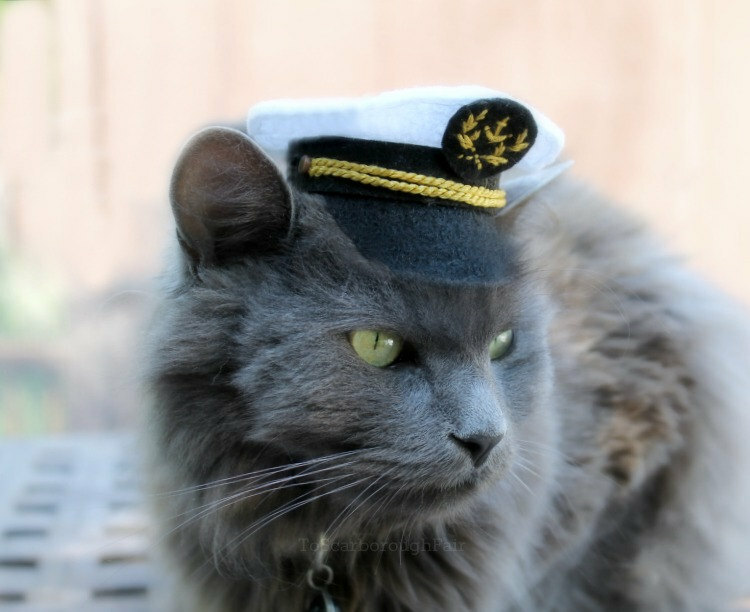 If your cat is more of a rule-following, early-rising, bossy-boots control freak, this Marine Captain hat might be just the ticket. Lesser cats (and possibly humans) will fall into line under the command of Cap’n Cat – just look at the expression of the cat in the photo: she means business. Aye aye, kitty. And for the final image, I couldn’t decide between the Halloween themed witch’s hat or the beautiful spring hat. 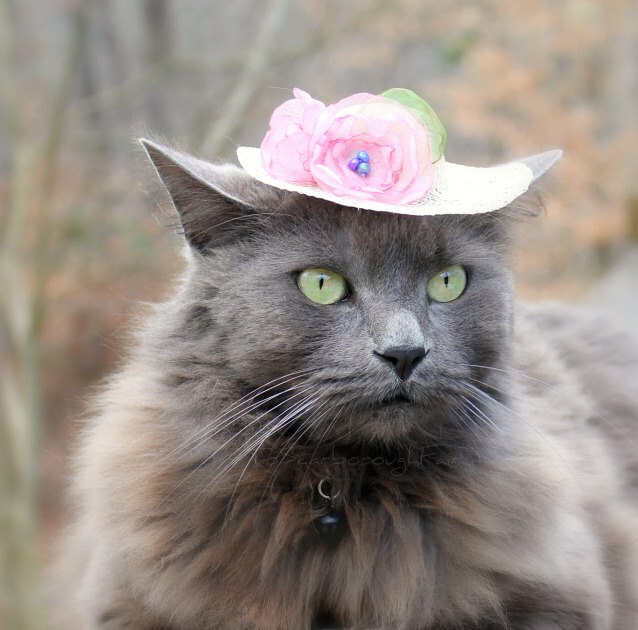 So here they are – whether your cat needs a scary costume for a party (or to stand up to that neighbourhood bullying dog) or a pretty spring hat to wear to the races or a garden party, this etsy shop will have a cap that fits. 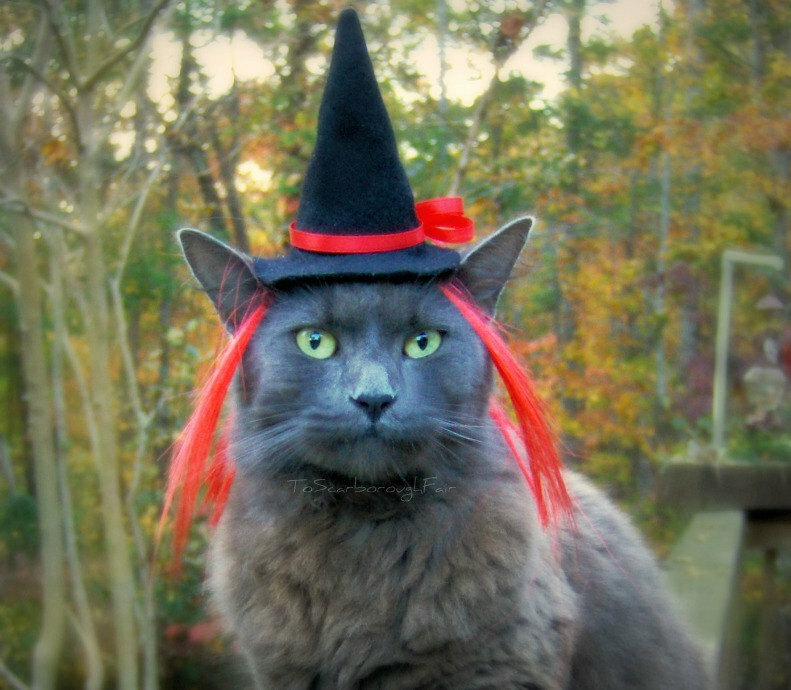 If you now realise your cat is underdressed and needs to step it up a notch in the fashion stakes, or if you just want to look at more funny pictures of cats in hats, then you should definitely check out To Scarborough Fair here. Look, I’m no Dr Doolittle or Cesar Milan (I think that is the Dog Whisperer guy’s name), and yes, my own dog Goldie is in fact made of synthetic fibres. But even I can work out what the pug dog in this picture is saying. He is saying SAVE ME. 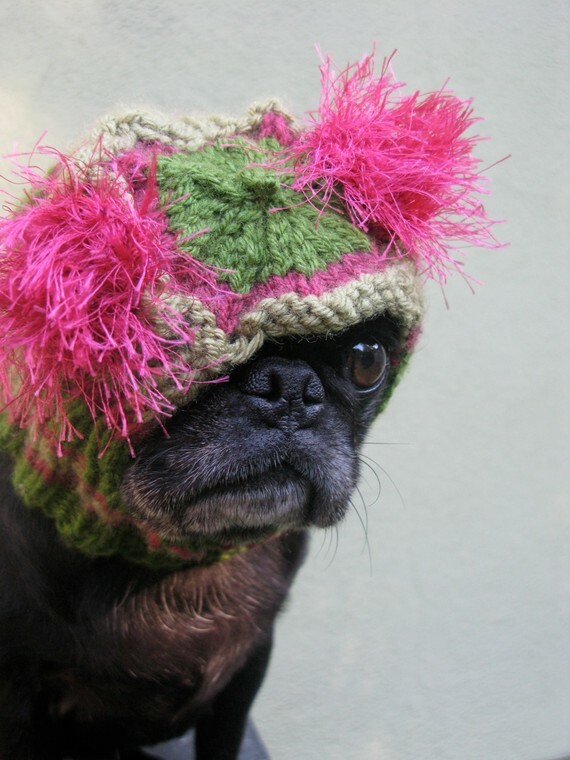 This ‘custom snuggly dog hat’ is knitted by a lady in America, who has a shop on etsy dedicated to dog hats of various styles, colours and levels of humiliation. From the mildly disturbing football-fan look on the left to the Parisienne style modelled on the right, this shop has a fabulous collection of photos that are just waiting to be made into a coffee table book. (Honestly, I found it hard to choose the pics for this post – there is an aviator hat complete with knitted goggles, a piglet hat and a flower child hat, to name just a few.) I know that people love their dogs (or ‘fur children’ as they are sometimes called), but I’m not sure that this is the way to show your affection for your pooch. Although maybe I’m totally wrong and there are fierce walk-offs at dog parks all over the world, with fashionista pups strutting down the (ahem) catwalks, vying for the attention and approval of other dogs and their ‘fur-less parents’. 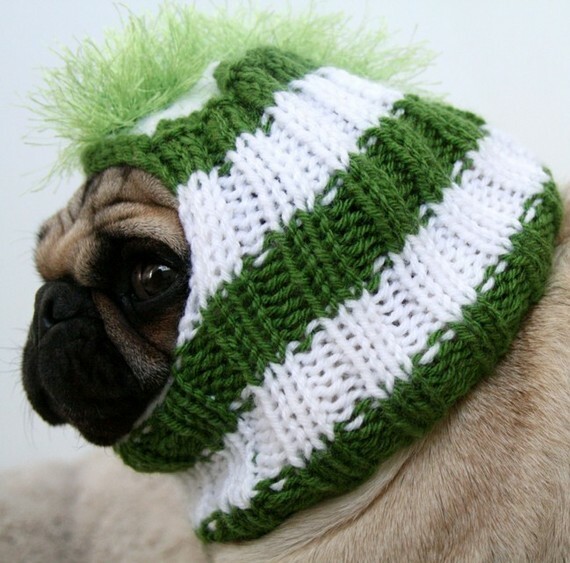 Maybe dogs love fashion as much as some humans and maybe they also like to look glamorous while keeping their heads warm. Maybe. 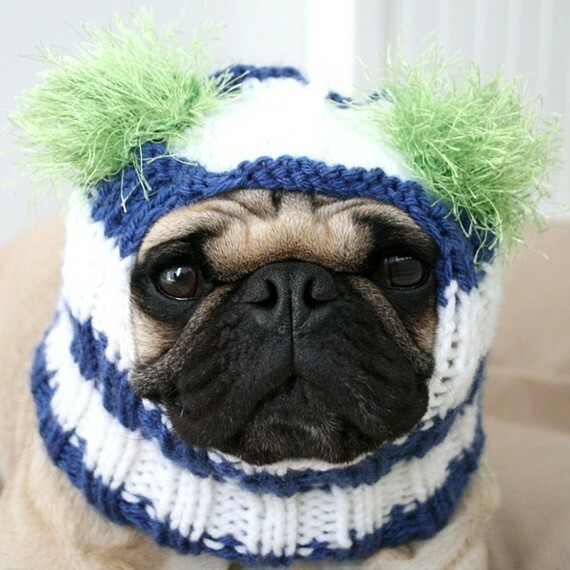 Jessica’s knitted hats for pugs (how’s that for a niche market?!) are on etsy and her shop is definitely worth a look. Even if you don’t have a (real) dog. Fashion Sparks Sparks in the wild WWWhat?